Oh yeah, nothing like finding a new flavor in the freezer section. It's been awhile since I've had one of Edy's (Dreyer's) Loaded Flavors, but I knew I had to try Caramel Cone Crunch the second I saw it. Sure, technically it's a "frozen dairy dessert", but it has cone pieces in it! and they're chocolate covered! Admit it, I haven't even started reviewing it yet and you're already thinking about going to the store now aren't you? Ok, you ready? 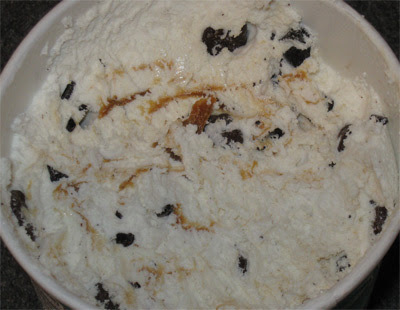 The exact description is "vanilla swirled with caramel, chocolaty covered cone pieces, and chocolaty chunks". I was so excited that when we got home, we had ice cream first, and then lunch later. Well, I wasn't disappointed. This is a vast improvement over (the falsely named) Edy's Drumstick. It's nice, I like it. Since it's a frozen dairy dessert, it was a bit melted at the top by the time we got home, and overall it was soft, but I really liked it. It's loaded, so we're not going for texture and quality here, you go with loaded for flavor and this one lives up to its name. The best part ofcourse is the big, crunchy, chocolaty covered cone pieces. They aren't in every bite, but there's still a decent amount. There's also nothing wrong with the caramel, and the chocolaty chips actually have a nice bite to them. I really hope this flavor holds up once it refreezes, I'd hate for it to be ruined by that rubbery feeling you get from a lot of Edy's frozen dairy dessert. On Second Scoop: Well, it's as I suspected....I still like it! Yeah, the rubbery texture kicked in a little, but it's not awful and doesn't ruin the overall experience. The cones pieces continue to be crunchy and plentiful, and if you happen to not get a cone piece, you're sure to get a big chocolate chip in it's place. On Third Scoop: I just want to say it one more time: I'm really enjoying this ice cream, even if it's a little rubbery/chewy, I love the flavor. I need a support group for my addiction to this ice cream! I buy and Eat a carton every other day! I have a serious problem! It satisfies my chocoholism, my caramel need and the crunch factor is amazing! hahaha, too funny! 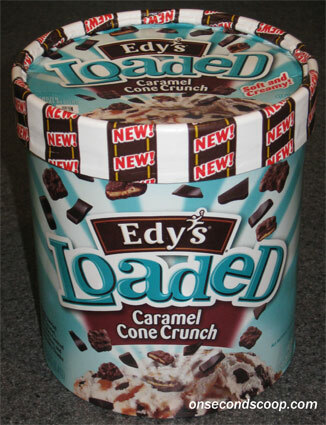 by far one of Edy's best flavors and probably my personal favorite of theirs! How can you not love this one? Where did it go? I can no longer find it! oh, don't say that gb!! just checked the website, where did all the LOADED flavors go?